If you are looking for the most fabulous and wonderful dress to rock, then you ought to check out the astonishing collection below. This post has to offer you 8 striking masterpieces that will blow your mind away. Spring 2015 Couture runway was full of wondrous designs that could take one’s breath away, but these are the best of the best. Scroll down to enjoy the stunning outfits by Chanel, Christian Dior, Atelier Versace, GiambattistaValli, UlyanaSergeenko, Jean Paul Gaultier, Elie Saab and Armani Prive. I can guarantee that you will fall in love with every single look, as this set is filled up with alluring and engaging vibe. Ulyana Sergeenko released a striking collection capable of taking your breath away. This marvelous number is designed for those ladies who are not afraid of bold combinations and catchy fits. The strapless bustier gown features a mid-ankle length, laser cut-out panel along the bodice and a cool apron skirt. The outfit is presented in a very engaging color palette as well, as you will spot dark turquoise, black and white. Overall, this is an excellent look to sport to some high end fashion event – you will surely be the queen of the night. 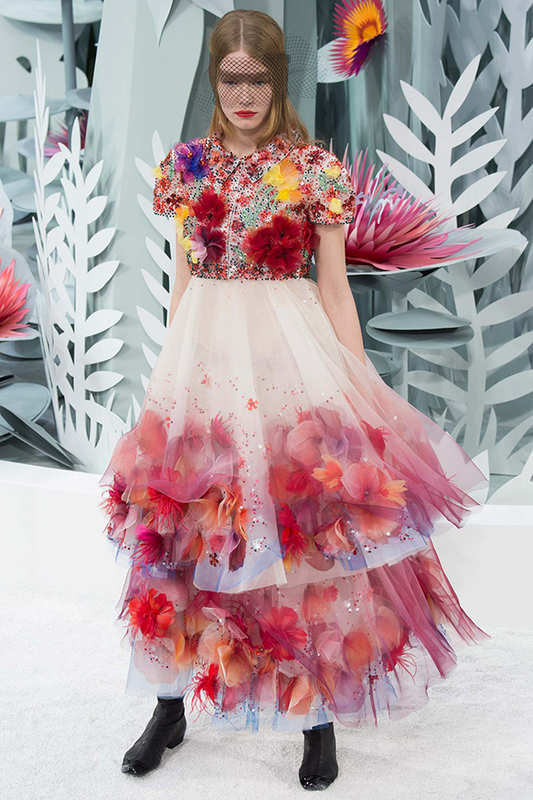 Giambattista Valli offered an adorable dress that will definitely speak to you a lot. There is no way one can stay untouched by this marvelous number, as it is full of exquisite and sophisticated touch. The very first association that came to my mind the moment I saw this piece was Cinderella’s ball. Just imagine how easy it is to stun your prince (and everyone else around) with this stunning frock on. Similarly, you can easily disguise and keep your identity unrevealed whenever required with the help of the elegant headpiece with a veil. Jean Paul Gaultier decided to combine two of the trendiest colors of this season and came up with an awesome outfit. Burning red is paired with elegant white to create a magnificent design. I am completely taken aback by this saucy frock and have no doubt that so will you be. The strapless fit goes well with the asymmetrical design of the dress. The right part in a vibrant hue also features a draped top and a flare skirt, whereas the left half is presented by a plain and quite regular design in ecru. If I were ever invited to some fashionable yacht party, I would by all means rock this gorgeous number. Elie Saab could not miss this chance to impress his numerous fans. The Lebanese designer released a splendid collection of dresses that are worth dying for. You will fall in love with every single item showed off on the runway, but here is the one that is likely to gain the most of your love and appraisal. 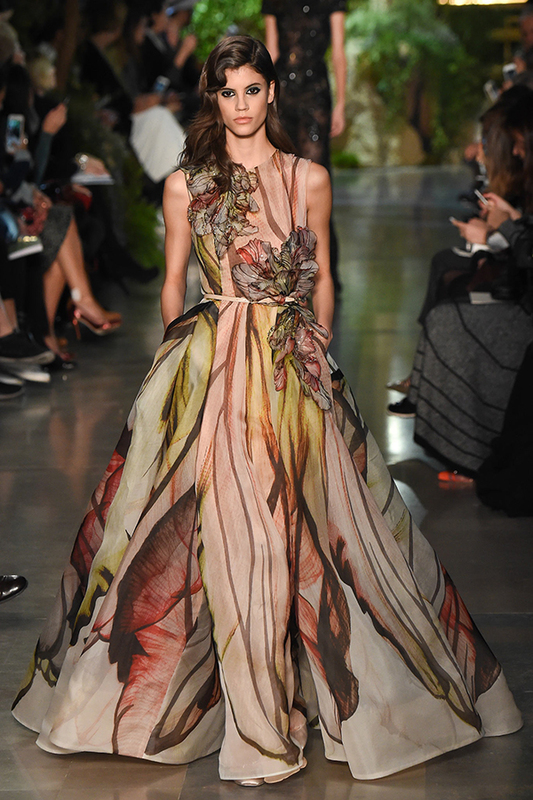 This sleeveless floor-length gown deserves to be called a true masterpiece. The light and floating silhouette of the frock is combined with one of the most amazing and hypnotizing color palettes in the universe. You will spot here anything from ash gray and light brown to delicate plum and light green. Additionally, the precious fabric is embellished with a fascinating pattern which makes it very hard to resist this number. Christian Dior opted for a classic black and white combo and designed a very sophisticated and luxurious design. The strapless bodice in black is complemented with a floor-length high waist skirt in white. The latter is embroidered with lovely patterns in black, which adds up to the overall impression. This is a perfect ball gown indeed, as due to its monochrome color combination and quite moderate styling one can rock it to any possible occasion. Atelier Versace presented a stunning cocktail dress in lust red. As this is one of the best colors for a frock, it hardly makes sense to list all the advantages of this number. The only important thing worth to mention is the design of the piece. A one-shoulder dress with a geometrically cut neckline and asymmetric slit in front obviously draws an image that one will find very hard to resist. Moreover, this is not something that you are likely to see very often, so why not to add this masterpiece to your collection? Chanel opted for the splash of color and the richest embellishment ever possible, and this is the result of the brand’s inspiration. This adorable chiffon gown in white feature short sleeves, layered skirt and a great amount of feathers and organza. The latter two materials are presented in so many colors, that it does not even make sense to list all of them. Besides, the upper part of the frock is also styled in a very alluring way, leaving one without a single doubt. 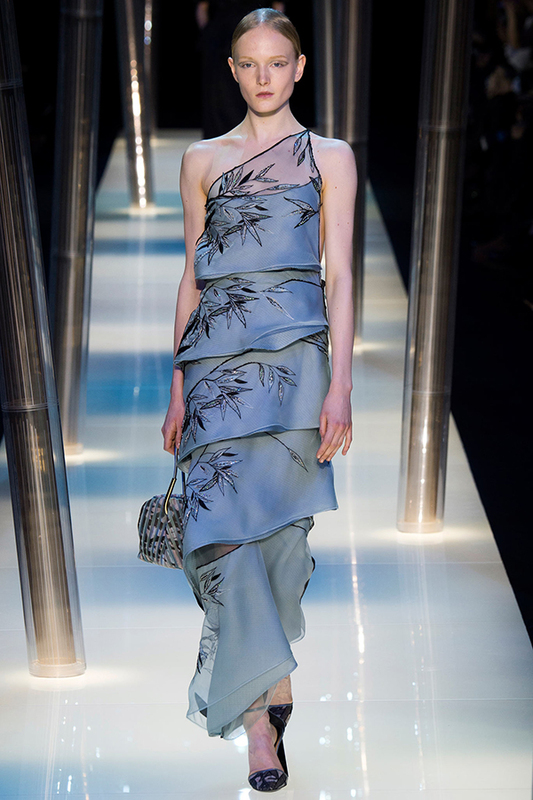 Lastly comes a piece by Armani Prive. This is a very elegant and precious dress, that will make your mouths water. The one-shoulder fit is combined with layering and outstanding design. Delicate silk in sky blue is embroidered with an absolutely breath-taking pattern in a somewhat Japanese style. One can be easily inspired by the stunning view of this frock and come up with a couple of Heiku poems. 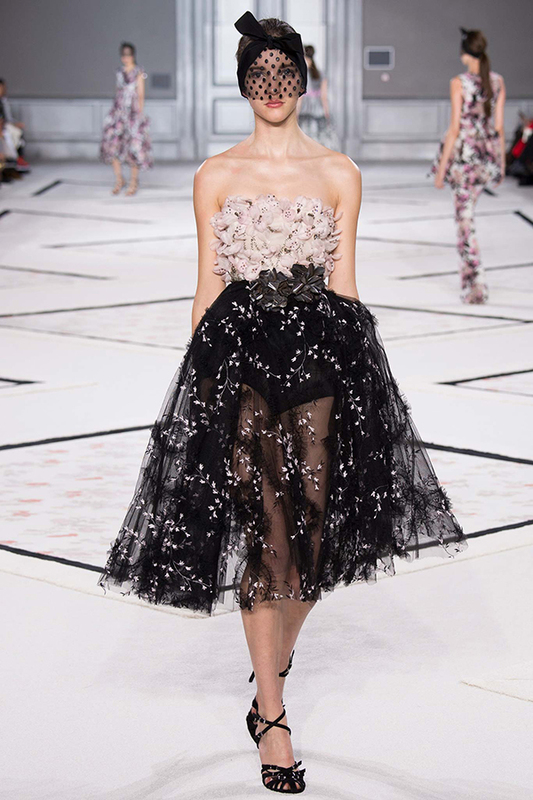 These were the most astonishing Couture dresses from Spring 2015 runway. Which one did you like the most?